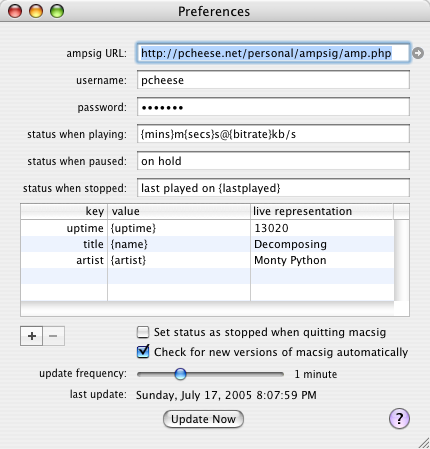 A Mac OS X + iTunes client for ampsig. ampsig supports "schemes" which allow it to take various colors and forms, enabling you to configure its appearance to your heart's desire (take a look at the examples on the ampsig screenshots page). macsig is an AppleScript Studio application that communicates with ampsig, feeding it the information to display. It primarily monitors and reports changes in iTunes and optionally sends information about how long your computer has been running.